You could say that my husband and I fell in love with each other over words. Within a few weeks of meeting, I recited to him and his writing group my poem about the mysterious Grimple Snooklesplat, and he shared with me his rather frighteningly eccentric podcast about the Budge-Nuzzard. I impressed him by casually remarking, “Cease this blateration, you frutescent snollygoster!” in a Facebook post. He sent me lists of fake words and hilarious definitions he had made up, and I suggested a few of my own. We read each other’s books. Now, we have friendly marital spats over pronunciation, correct usage, and grammar. He’s endlessly fascinated by etymologies—word origins—and sends me on completely random iPhone dictionary searches while we’re driving down the road. I’m more interested in the way words sound: the music of certain lines of poetry (“fall, gall themselves, and gash gold-vermilion”) evokes a visceral kind of joy in me. We’re writers. We have a crush on words. It goes with the territory. An artist was once asked why he became a painter. He answered, “Because I love the smell of paint.” When I teach creative writing to kids, before we ever get to stories or poetry, that’s where I begin. A good writer loves words, I tell them. You have to love the way they look and the way they sound and the way they come together to make meaning. You have to love what words say and the way they say it. You have to love learning new words and collecting them the way other people collect stamps or rocks or dead insects or paintings. Gobsmacked. Persnickety. Tomfoolery. Slurp. Dawdle. Archipelago. Think about it like this (I say to kids): If you wanted to build a fantastic city you had dreamed up—full of colorful houses and soaring skyscrapers and meandering roads and harbors and Ferris wheels and libraries and lampposts—and you could only use Legos to do it, would you rather start with the first pile, or the second? Now imagine those piles are words. 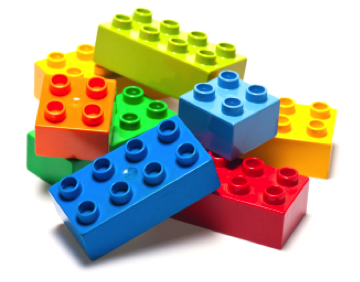 “Building vocabulary”—or as I’d prefer to say, “Embarking on a journey of word-discovery”—simply means gathering a bigger pile of Legos so that you can build the marvelous stories and poems that only you, with your unique imagination, can tell. And the more words there are in your pile, the better builder (and storyteller and poet) you will be. In this quest to help kids fall in love with words, I discovered one of my best teaching tools in a book titled Poemcrazy: Freeing Your Life with Words by Susan Wooldridge (http://susanwooldridge.com/books/). I am now the world ambassador for Poemcrazy (or should be, I love and tout it so much!) and have introduced students and workshop participants of all ages to the activity that serves as the material heart of the book: making what she calls “word tickets.” Trust me, it’s fun. And trust me, it opens the door to a hundred possibilities for creative writing games and exercises with your family. So in this post, I’m going to give you some quick instructions for embarking on a word-ticket journey with your kids, and in the next couple of posts I’ll offer a few sample activities for playing with these little literary building blocks. Here’s the gist: Wooldridge writes words (or pastes words she has cut out of newspapers and magazines) on blank raffle tickets—the kind you can buy in thick rolls from Staples or Office Depot. One side says, “ADMIT ONE,” and the other side is blank. Once the tickets are pulled apart and the words are added, you’ll have a big pile of word tickets to use for all kinds of different writing games, poems, and brainstorming sessions. I keep my tickets in a box that I decorated with patterned paper and favorite words. A box that will serve as the treasure chest for your family’s word collection (a shoebox will do fine). Make it look inspiring. You could write words on it, draw on it, paint it, or decorate it with stickers, colorful paper, and pictures cut out of magazines. A roll of raffle tickets (available cheaply from office supply stores). Tear the tickets apart so that you have a big pile of single tickets. 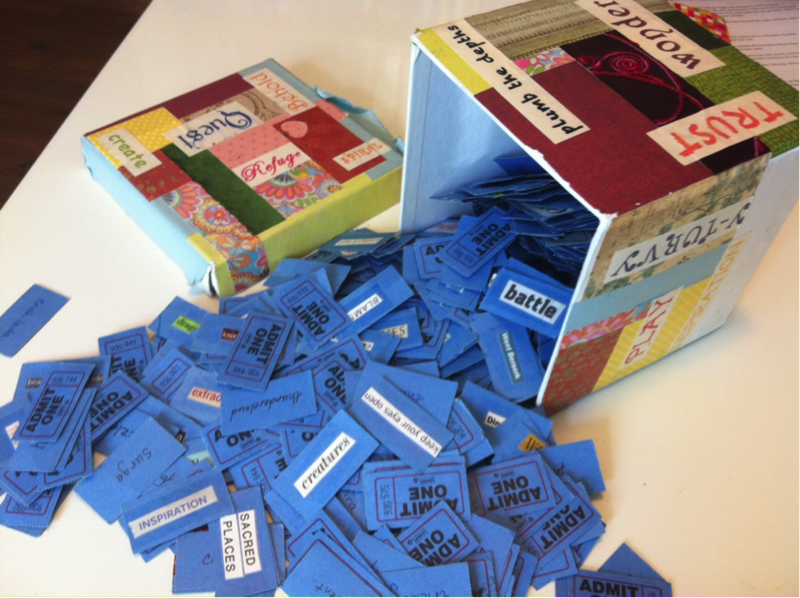 If you can’t find raffle tickets or don’t want to buy them, you can also use index cards, cut into one-inch strips. Old magazines, newspapers, unwanted books, cereal boxes, coupons, and just about any piece of paper with words on it that you can tear apart and cut up. Thrift stores like Goodwill often have bins of old magazines and picture books that you can buy very cheaply. Scotch tape or a glue stick (I usually use tape). A dictionary (you won’t cut this up). A thesaurus, spelling book, or any vocabulary lists you may have around the house, to search for ideas (you won’t cut these up either). First, get out your scissors and sit down right in front of that stack of magazines and cut-up-able stuff. You’re going on a treasure hunt for words. Search for interesting, juicy, energetic, vivid words, cut them out, and tape or glue them to the blank side of the tickets. There are no rules about what words to include or not to include in your collection. Find words you like, words that are fun to say out loud, nouns, verbs, adjectives, adverbs, words you don’t know that you have to look up in the dictionary, and phrases that are unusual or funny or beautiful. .
Take your word collection for a test run by trying to form silly sentences entirely out of tickets. As you can see, this is kind of like a giant game of refrigerator poetry, which is actually a very good writing exercise. A huge part of the fun of writing is playing with words, putting them together in new ways, stretching their possibilities. When I use word tickets in class as writing prompts or raw material for poems, the results are sometimes beautiful, sometimes hilarious. The kids are eager to discover new words or to put together words they know but wouldn’t normally think of using. With these basic building blocks of words spread out in front of them like literary jigsaw puzzles, they build descriptions and poems that have brought me to tears on more than one occasion. My box of word tickets has become a permanent fixture in my classroom. How can you use them? Stay tuned for Part 2 . . .
Special note: If your family has fun making word tickets, your kids will have a head start on my online writing class “Playing with Words,” which begins August 24. For the next three weeks, Story Warren readers can use the coupon code RABBITS to get 15% off registration for this or any of my other online classes. For more information, see my website http://www.sleepinggiantclasses.com. Jennifer, the little beast that lives in my own heart wants desperately to meet your Grimple Snooklesplat. This is wonderful, Jennifer! Oh, how I love the sound of words.